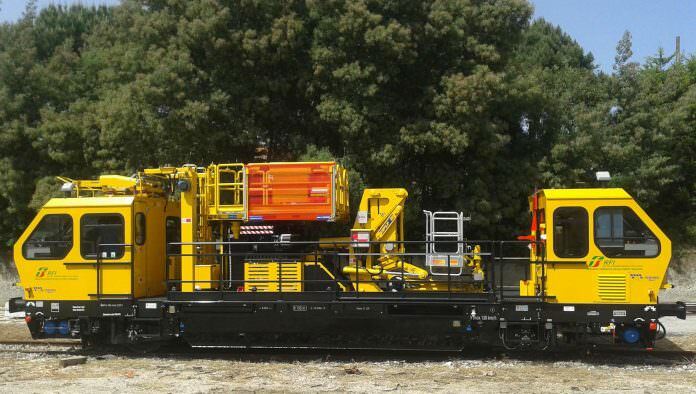 For the first time in Italy, a maintenance vehicle designed for working on overhead catenary will be allowed to run on the national rail network as a ‘normal’ train. Built by Tesmec Service for Italian infrastructure owner Rete Ferroviaria Italiana (RFI), the model OCPC400 multipurpose maintenance vehicle has been fitted with an SCMT/SSC BL3 automatic train protection system. This provides interoperability between SSC (Sistema Supporto Condotta), used on secondary lines, and SCMT (Sistema di Controllo Marcia Treni), the ATP system which is deployed over the main line network. The system controls the speed of the train based on the existing speed limit and the aspect of the next signal along the line. As a result, the new vehicle has been granted AMIS authorisation to enter service (Autorizzazione di Messa In Servizio) by the national agency for railway safety (ANSF – Agenzia Nazionale per la Sicurezza delle Ferrovie), the first such vehicle to be so authorised.